Here I am getting all 1950s Grace Kelly on you. For this month’s “How I Wear My” post, Adrienne of The Rich Life (on a budget) and I thought it would be good for our wallets (and the environment) to focus on secondhand pieces. While we are not on a spending freeze it’s nice to resist all those tempting end-of-summer sales and focus on thrifted or even hand-me-down items. Secondhand can be even more wonderful than new! These sunglasses and scarf are the perfect case-in-point for me. Two of my secondhand treasures come from my husband’s family, given to me by my mother-in-law. The mid-1950s sunglasses were hers, and the silk scarf belonged to her mother and features ladies in different little hats, which I love. This is actually how I would wear these two accessories out of the house. In case you were wondering what else I was wearing. One of the things I love most about receiving a secondhand garment or accessory from a family member is that there are usually photographs showing the way the original owner wore them. So here’s how my mother-in-law styled herself with these sunglasses in 1957! 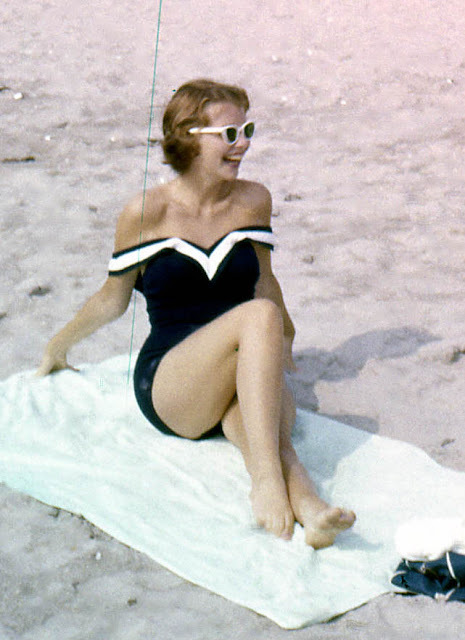 My mother-in-law as a very foxy 17-year-old in Wildwood, NJ in 1957. Love! What secondhand treasures do you own? To mark the 1st anniversary of the “How I Wear My” series, won’t you join us in a toast to two beautiful autumn colors, Burgundy and Bordeaux? Whether you go for purple-tinged Burgundy or chocolatey-red Bordeaux we’d love to see how you are wearing two of fall’s most bewitching shades. So send Adrienne or me a picture of yourself for “How I Wear My: Burgundy and Bordeaux” by October 1. And please do head over to Adrienne to see everyone’s Secondhand Treasures! This may be my favorite post of yours! But it's hard to say for sure...I love all of them. That photo of your MIL is adorable and yes, she is looking hot, hot, hot in that photo. Those glasses are fantastic and I would wear them all the time if I were you. They were made for your face shape. And the scarf is just plain adorable. Your J. Crew sweater looks terrific with it. This was a fun HIWM. I am already thinking what Burgundy or Bordeaux look I'll wear for October. Love those shades on you! The scarf is gorgeous, too! How fashionable is your MIL? Wow! The scarf is fabulous and your mother in law was quite the babe on the beach! That photo of your mother-in-law is amazing!!! And those frames and scarf have really stood the test of time. Love your whimiscal poses in this post, too. I love love your scarf AND the glasses you got from your mother-in-law. These two accessories never go out of trend. They just need a little touch of modernity and I like the way you wear them. I have a large collection of scarves which were offered to me by my dear husband and I have a few (precious)inherited from my Mom - who passed me her addiction for scarves.... A genetic thing. Too bad I have two boys! LOL ! You look amazing! I love the headscarf look, but I an never get it right. The scarf and sunglasses are perfect with that sweater.